I'd been eyeing this camera for a couple of months. For some insane reason I have had this bug to do large format pinhole photography and have been shopping around for cameras. I have also been interested in zone plate photography so, hands down, the Zero 45 won the in the "WANT" department. So when I came upon some extra cash I bought it! It was a birthday present to myself. Since my Zero 2000 has the same wide angle as the Zero 45 without an extension frame I added one to my setup. I thought it would be nice to mix things up a little bit and have options. My very generous friend Jeff sent me an amazingly awesome magazine contraption that holds six sheets of film! And I received a pack of Arista 100 for my birthday. So I was set! I spent the week trying out all of the various settings. I shot a couple with the extension frame, without the extension frame. I shot a few using the zone plate settings. It didn't take long to get through six sheets. I ordered a Mod54 and developed them Friday evening. Since I don't have a scanner that will scan 4x5 I went to Newspace to make prints of them. The whole process has been fun and a great learning experience. I am not sure what to make of the actual photos concerning subject matter and composition. I suppose I will get a handle on this the more I use it. Practically I have a lot to learn. For example, I really scratched the negatives getting them into the tank and I will need to be more careful next time. Another consideration is to load my tank in a light proof room as the dark bag is a bit too small for all of the stuff inside of it. 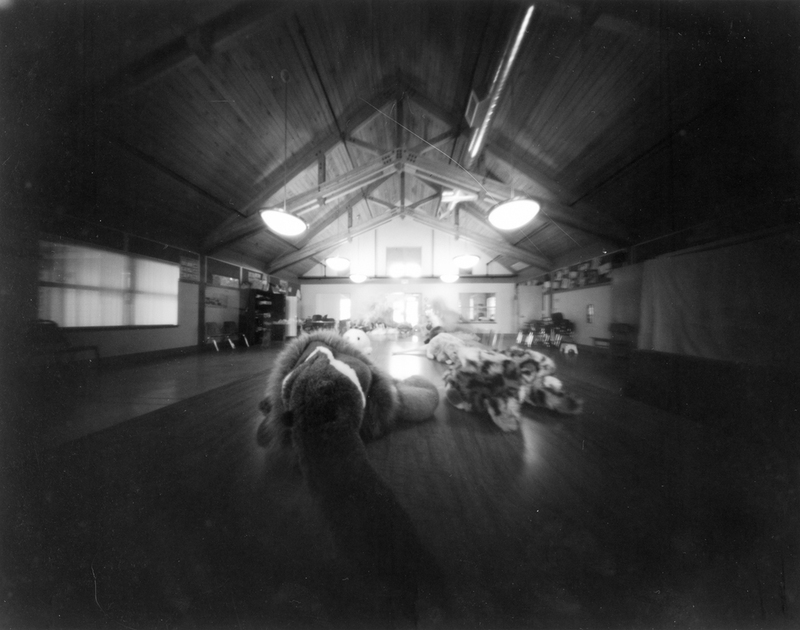 Pinhole, no extension frame (25mm). 4 minute exposure. Zone plate with one extension frame (50mm). 4 minute exposure. Pinhole. No extension frame (25mm). 1 min. 25 seconds.